Liverleaf. 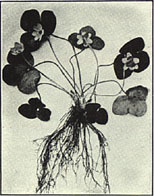 (1) Hepatica americana Ker. ; (2) H. acutiloba DC. (1) Round-leaved hepatica, common liverleaf kidney liverleaf, liverwort (incorrect), noble liverwort, heart liverwort, three-leaved liverwort, liverweed, herb trinity, golden trefoil, ivy flower, mouse-ears, squirrel cup; (2) heart liverleaf, acute-lobed liverleaf, sharplobe liverleaf, sharplobe hepatica. The common liverleaf is found in woods from Nova Scotia to northern Florida and west to Iowa and Missouri, while the heart liverleaf occurs from Quebec to Ontario, south to Georgia (but rare near the coast), and west to Missouri and Minnesota. The hepaticas are among the earliest of our spring flowers, blossoming about March and frequently sooner. They grow only about 4 to 6 inches in height, with leaves produced from the rootstocks on soft, hairy stalks spreading on the ground. The thick and leathery evergreen leaves are roundish or kidney-shaped. The bluish to purple or white flowers are about half an inch in diameter and are borne singly on slender, hairy stalks arising from the root. The heart liverleaf is very similar to the common liverleaf, but has sharp leaf lobes while those of the common species are very blunt. The leaves of both species, collected in April. prev: Leather Woodfern. (1) Dryopteris marginalis (L.) A. Gray; (2) D. filixmas (L.) Schott. next: Lobelia. Lobelia inflata L.